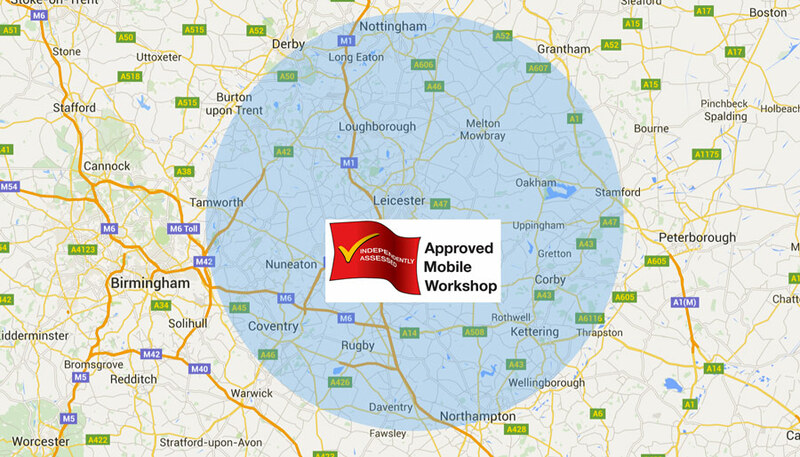 We offer caravan servicing Leicester and cover Leicester, Leicestershire and Rutland. This includes the following areas:- Leicester, Rutland, Melton Mowbray, Oakham, Syston, Thurmaston, Loughborough, Kirby Muxloe, Ratby, Glenfield, Markfield, Narborough, Enderby, Countesthorpe, Blaby, Wigston, Market Harborough, Lutterworth, Coalville, Ashby-de-la-Zouch, Swadlincote. We generally cover an area within 40 mile radius of Leicester but please contact us to find out whether we cover your area. *A fuel surcharge may be applied to other locations.